One of the advantages of digital SLR (single-lens reflex) cameras is the ability to use a variety of different lenses. Changing lenses on your DSLR isn't difficult, but there are good ways and not so good ways of going about it. Here are a few things to keep in mind when changing lenses. 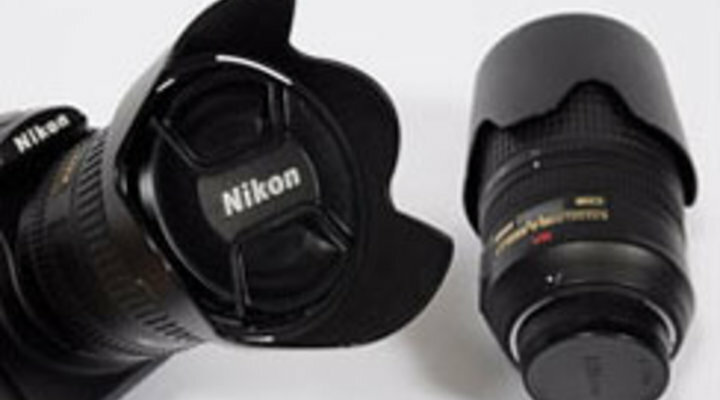 Nikon's DSLR cameras and lenses use a bayonet-style mount called the F Mount. Before attempting to mount or dismount a lens, make sure the camera's power is turned to the "Off" position. To mount a lens, match up the mounting index dots on the lens and camera body, insert the base of the lens into the mount and then turn the lens counterclockwise until it locks in place. Pressing the lens release button on the body and turning the lens about a quarter turn clockwise will remove it. Anytime you change the lens on an SLR, you risk letting dust enter the camera. That dust can settle on the low-pass filter which is directly in front of the image sensor and can result in what looks like smudges or black or gray dots on your photos. To minimize the chance of that happening, you want to expose the inside of the camera body as little as possible when changing lenses. That means having the lens you want to put on the camera ready to go before you take the current lens off the camera. Again, make sure you turn the camera's power off before changing the lens as the image sensor itself generates a static electric charge that can attract dust. If you are using a VR (Vibration Reduction) lens, you will also want to turn the VR switch on the lens barrel to "Off". Next, shield your camera by turning your back to the wind, rain or dust that could possibly blow into the camera. When handling a lens, grasp the lens barrel and avoid touching the front or rear elements to prevent fingerprints. Get in the habit of always using front and rear lens caps to further protect the lens elements. Practice changing lenses at home to become efficient at doing it quickly and easily. The Nikon F-Mount was first employed on Nikon's earliest lens-interchangeable SLR camera, the Nikon F, released in June 1959. Nikon has consistently utilized the same mount without changing its basic structure, even as other SLR camera manufacturers found it necessary to alter their lens mounts in response to changing technologies, such as autofocus compatibility and digitalization. One of the biggest advantages of lens-interchangeable SLR cameras is that users are able to choose from a larger selection of lenses. Maintaining the same basic structure of lens mount for a longer period means a broader, constantly growing array of compatible lenses. For this reason, the lens mount is an extremely important and symbiotic element for both photography enthusiasts and professionals, who are able to benefit from ongoing use of their carefully selected collection of lenses. The Nikon F-mount, employed for even the latest, most advanced digital SLRs, has received and continues to garner the highest evaluations as a reliable, long-serving lens mount. Learn the steps to changing your camera's lens.